The new generation of rope lock has arrived. The Restrictor rope lock prevents release of the rope when an out-of-balance condition exists. If the operator cannot overcome the imbalance by physical strength the rope lock will not disengage. The unique handle and cam design enables the Restrictor rope lock to remain closed without the use of an oval ring in an out-of-balance situation. With all steel construction and 41/2" long shoes that grip the rope, the Restrictor is the strongest rope lock on the market. With the ability to mount on any standard locking rail as well as Tiffin Scenic Studios, Inc. heavy duty locking rail, the Restrictor rope lock is great for new and existing installations. For more information on the Restrictor rope lock, contact Tiffin Scenic Studios, Inc. or an authorized dealer. Rope locks for counterweight systems as specified shall be of automatic type positively preventing release when an out-of-balance condition exists, which is in excess of the physical strength of the operator to overcome. The rope lock shall be of all steel construction with gripping shoes a minimum of 41/2" long operating through double toggle action for even compression on rope throughout entire length of shoes. Provisions shall be incorporated to allow adjusting the shoe clearance to compensate for control line stretch. Internal concave surfaces of shoes to have rounded lands. The operating handle shall be of round configuration for comfortable hand grasp. Length of hand lever shall be a minimum of 9" and arranged with toggle action such that the throw in the closed staying position is approximately 31/2 degrees beyond center for avoiding use of separate oval ring. Side plates of the lock housing shall be a minimum of 3/8" thick cold roll steel. The rope lock shall be certified by an independent testing laboratory to hold in excess of twelve hundred (1200) pounds. Size of housing shall be adequate for entirely enclosing the mechanism at the sides, approximately 19" tall by 43/4" deep. Unit shall be provided with a Corbin Plunger type tumbler lock allowing locking in the closed position against use by unauthorized personnel. The plunger shall permit locking without use of key — all locks to be keyed alike. The rope locks shall be the Restrictor lock as manufactured by Tiffin Scenic Studios, Inc. Mounts to any Locking Rail. Theatrical rigging equipment to be operated by experienced personnel only. Intended use of the Restrictor rope lock in an out-of-balance situation is not recommended. 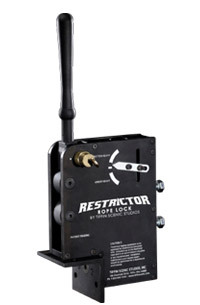 The Restrictor lock is engineered for use with new or good condition 3/4" diameter Multi-line II or equal rope. Installation, maintenance and related repairs should be performed by a experienced professional. Rope lock capacity may exceed locking rail design.